If you follow any kind of style account on Instagram, then I’m sure that by now you’ve seen at least one social media fashionista wearing a pair of lace-up flats. I noticed them popping up on a few different blogs and Instagram accounts a few weeks ago, and now I feel like I can’t scroll through my feed without seeing at least one image of them. Lace-up flats are a huge trend right now, and if you want to get in on it, you better do it quickly – before we know it, it will be too cold to wear them. Inspired to buy a pair for yourself? Go for it – and keep reading. Lace-up flats are so pretty, but they can also be a little hard to wear because there’s kind of a lot going on for such a small item. They’re delicate, very feminine, and they ask for attention. It’s hard not to stare at someone when they have these gorgeous flats on their feet. But the good news is that they’re also a perfect transition piece for the beginning of fall: it’s chilly enough to want to give your feet more coverage than a sandal, but still warm enough where you don’t want to suffocate them in boots. Enter these! So, how should you style them? 1. Toughen up your lace-up flats with destroyed black jeans and a leather jacket. 2. Make your summer dress work for fall by adding these flats and a blazer. 3. Pair colorful lace-up flats with a simple black and white jeans and shirt combo for a chic and easy look. 4. Make denim shorts work for early fall with a long coat and lace-up flats. 5. 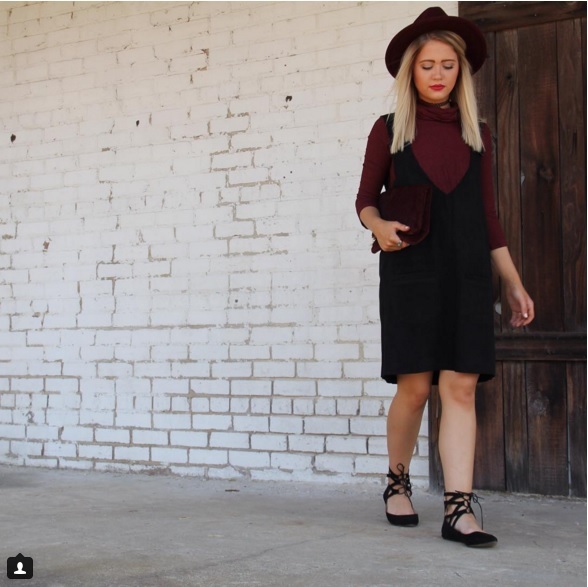 Another way to make a summer dress work for fall is to layer with a turtleneck and add flats and a hat. 6. Lace-up flats look so cute with a shirtdress and hat. 7. Red lace-up flats bring a bright pop of color to a black and white dress. 8. Wear your lace-up flats with skinny jeans that hit at the ankle (to show off the flats) and a light sweater. 9. Or skip the sweater and add a button down for a slightly more polished look. 10. 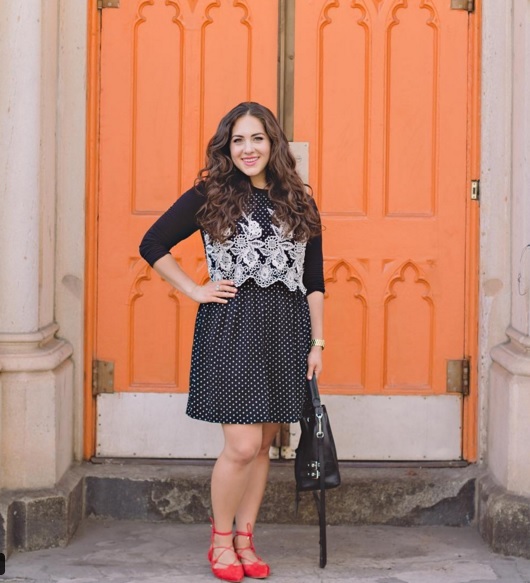 Cuff your pants if they’re on the longer side, and add a cardigan for the perfect fall outfit. 11. 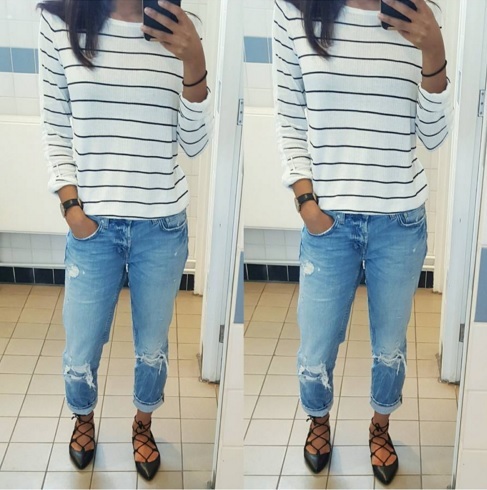 Cuffed jeans look just as good as cuffed pants. With a striped top, you’ve got a casual but chic outfit. 12. Pairing these delicate flats with loose boyfriend jeans creates a cool street style vibe. Add a button down to keep it from being too casual. 13. 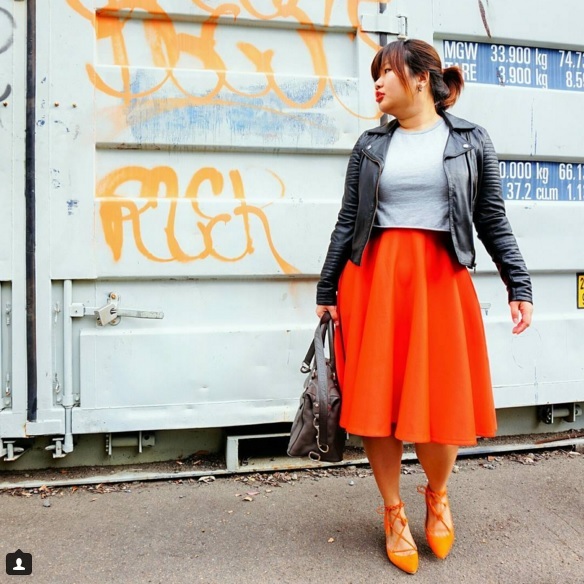 When paired with lace-up flats and a leather jacket, a bold midi skirt is actually perfect for fall weather. 14. You can’t go wrong all black. 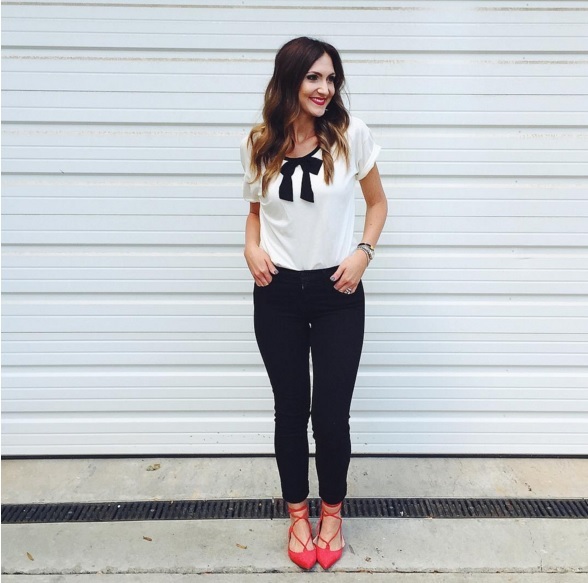 Wear black lace-up flats with black pants and a black sweater. 15. 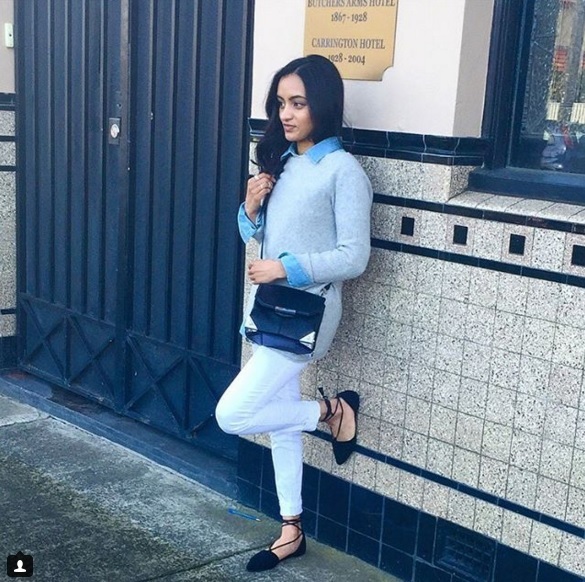 A super simple and comfy look is relaxed fit jeans with a simple top. The lace up flats keep it looking chic, but still comfortable. 16. You definitely can wear white jeans after Labor Day. Make them work for fall with layers and these flats. 17. 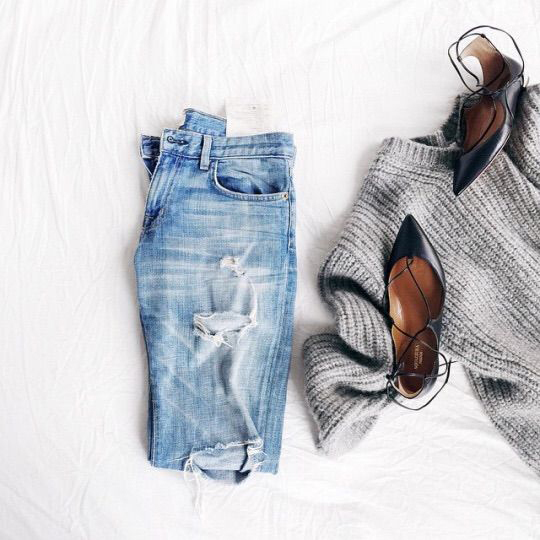 You really can’t go wrong with a cozy sweater, lace-up flats, and boyfriend jeans. 18. Enjoy your dresses without tights until it gets really cold. Long-sleeved ones work great for fall and look awesome with lace-up flats. 19. Yes, they can even be worn with overalls! The trick? Cuff them so they show off the shoes, and add a pretty top. 20. 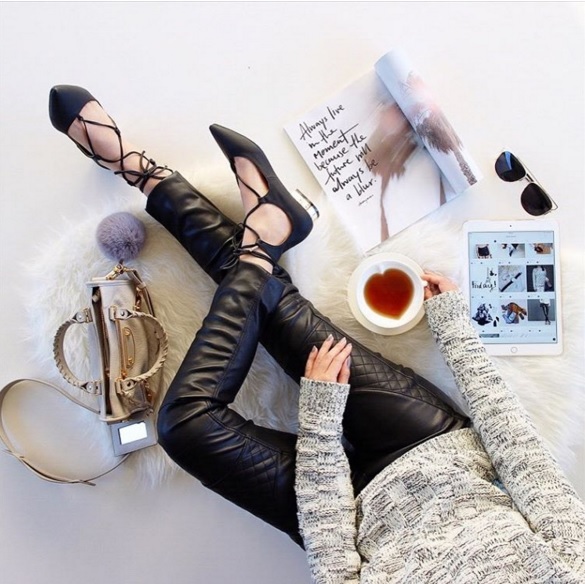 Leather leggings and lace up flats keep even the coziest of sweaters looking super glam.